"Is this how you live ?" he asked, "life in the country does not offer much." He persuaded the country-mouse to accompany him to the town and see all the good things there. down to enjoy a fine meal of cheese and fruit, a big cat leapt in through the window. 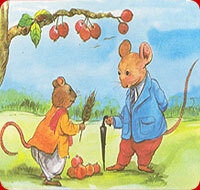 Seeing the cat, both the mice ran into their hole to save themselves, so the cat ate up all the cheese and fruit. When the cat had gone away, the mice came out of their hole. feast in such a danger." MORAL: Safety is the first importance.